Home / babies / babycleaningwaterwipes / care / MotherSparsh / Parenting / Protect / skin / Mother Sparsh Wipes – As Soft as Mother’s Touch. Mother Sparsh Wipes – As Soft as Mother’s Touch. The name Mother Sparsh itself describes the purity of its product. The journey of Mother Sparsh has started around 1 and half years back with a clear motive to launch baby products that are gentle and maintain baby skin health. Mother Sparsh is India’s first water based wipes. These are the only wipes that contain 98% pure water and aloe vera extract – a natural moisturizer. Infants and babies light up the lives of their parents and all other family members. They are the blessing for a family. They are very sensitive and fragile. So every parents wants the best for their babies, be it there clothes or products used on theirskin. Utmost care must be taken to protect them from germs. Now a day there is lots of buzz everywhere for Mother Sparsh and even lot of my friends suggested me this baby wipes. Being a mother I always investigate a lot for any products before using if for my baby .I read reviews on different sites and I also saw Mother Sparsh Video on Facebook ,they are claiming that Mother Sparsh are as good as soft cotton and pure water. MyAngel is 10 months old and having a very sensitive skin so I prefer to use products with least of chemicals. According to me Mother Sparsh are by far better than any brand available in market. It really helps the baby's skin to stay smooth, soft and supple. Here are some reason to choose Mother Sparsh Wipes. The main component of the Mother Sparsh Baby wipes is water and is probably the only water based wipes in India. This product is 98% water and rests 2% is completely natural herbs. Thus these wipes are as good as a fresh cotton ball dipped in clear water with natural herbs in it. These two key ingredients are completely safe and so these wipes are hypo-allergic or non-allergic and are completely safe for babies or even infants. 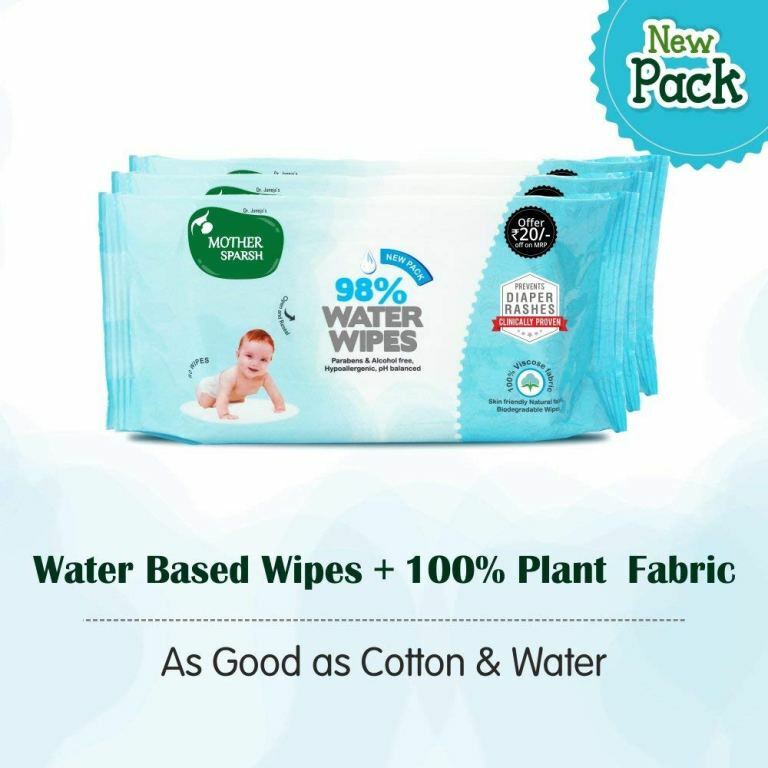 Mother Sparsh ensures the same care as a mother’s touch and a high level of hygiene in their Polyester Free Baby Wipes that are Skin Friendly Natural Plant based Fabric Wipes. The Mother Sparsh Baby wipes are absolutely free from any kind of chemicals and are also biodegradable wipes. They are clinically proven water based wipes are Parabens and Alcohol Free Wipes, which makes it absolutely safe for not only kids or babies but also for infants. All other brands baby wet wipes containchemicals such as alcohol and paraben. It can cause severe allergies to babies skin as their skin is 10 times more delicate than infants. But Mother Sparsh Baby wipes are free from all these chemicals. These alcohol free baby wipes are composed of natural herbs and water but mainly water. they are gentle on the skin and do not cause any allergy or rashes and thus it is the kind that prevents from Diaper Rashes Wipes. Recommendation: Do try out this wipes if you are worried for your little one’s sensitive skin, as Mother Sparsh are completely natural, hypo-allergic and pH balanced wipes. And even this product by Mother Sparsh is completely parabens and alcohol free baby wipes, most of the mother consider these wipes as the best baby wipes. I highly recommend trying these out for your baby. You won't regret it! It truly lives upto its name.